Chester based accountancy practice now well established in Wrexham. Do you want excellent customer service and solid knowledge that your business and account are being looked after by experts? Foremans LLP are far from the images of traditional accountants in a stuffy office wearing power suits surrounded by paperwork. 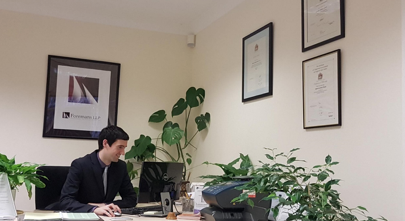 They adopt a modern, relaxed and totally professional approach to Business and Accountancy in a bright open plan office opposite Coleg Cambria in Wrexham town centre. They encourage our clients to drop in and offer free no obligation advice for all their Accountancy, Tax and Administration needs. With over 11 years’ experience they have everything you need for a fresh approach to setting up a new business, completing annual Self Assessments, to offering full accountancy services. They have dedicated Client Liaison Advisors so you will always speak to the same person without being passed around from one person to another, which ensures a solid relationship you can rely on. Having established the business on Chester Business Park 11 years ago they moved to Wrexham in June 2018 to fully equipped larger premises. Client are nationwide many of who have come via existing clients using £50 refer a friend scheme. Being a highly respected Chartered Accountant and Business Advisor regulated by the ICAEW they are able to give a hands on approach as well as support their clients so they can concentrate on running their much loved Businesses. Using modern and sophisticated software, a welcoming approach, comprehensive, and bespoke services they constantly build on our their own development to improve their client’s experience. The monthly direct debit scheme and free insurance provides clients with absolute peace of mind.